So, this morning was one of those mornings when you feel like SuperMom - only to be quickly reminded that you are, in fact, a mere mortal. Owen slept a little later than normal, so everything was going much more smoothly than usual. I managed to shower, dress and have a cup of coffee before any little ones woke up; made Owen scrambled eggs for breakfast, and a little strawberry and banana fruit salad (this is pretty special for a weekday - he usually has yogurt or a bagel). Owen and I talked and giggled through breakfast, and I gave Evelyn her medicine and started her breakfast in bed. She was still asleep, and we usually like to let her sleep in if possible. Owen continued to be cute, playing and bouncing around the house, and it felt like things were organized and in order. I threw the laundry around and went to check on Evelyn (i always have a monitor with me, but like to pop in and out in the morning so I don't miss her waking up). Well...instead of feeding Evelyn, I fed the bed. For those of you with experience in the special needs world, and with feeding pumps in particular - you know what I mean. For everyone else - there is a machine called a feeding pump that, well, connects to the feeding tube in your tummy and pumps in food - liquid food - often formula not dissimilar to baby formula. It is 'nutritionally complete', but since it isn't meant to be consumed orally, it DOES NOT TASTE OR SMELL NICE. It is SO gross. I might prefer the smell of poop to the smell of formula. Anyways, I apparently didn't connect things quite right, so the pump just slowly pumped all of the formula right into the bed. My lack of skill in this area is yet another motivator to make more Evelyn meals this weekend - no feeding pump required! So, our sweet nurse found me disrobing Evelyn and her bed to get everything cleaned up. The kicker? Evs slept through all the formula trickling onto her pajamas and bed, and woke up smiling as I was cleaning her up. Well, not to be deterred - sometimes something like feeding the bed would be just enough to turn the day sour - I decided we were in fact going to do plants today as planned. We all got ready, jumped in the car and went to Home Depot. It is one of the closest planty places near us, and is really easy to navigate with a wheelchair. 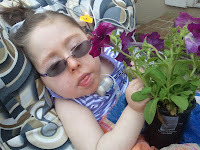 This was Evelyn's first outing since coming home from the hospital, and it really went well. 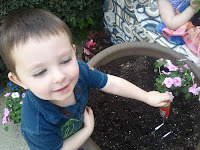 She chose pink, purple, white and blue flowers for our planters (Owen helped!) and we also bought all kinds of vegetables to plant in our garden in the backyard. 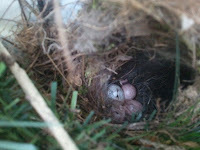 Then, we came home, ate lunch and started planting. We did good work, and got a little dirty. 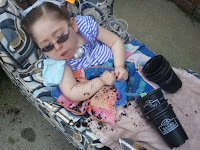 :) Of note, is that in these pictures, Evelyn IS awake, and enjoying getting the plants out of their containers and into the soil. In bright sunlight her glasses go into tint mode, and she often doesn't open her eyes as wide because they are a little sensitive to bright light. I'm not sure how much she enjoyed getting dirty, but she had fun. After we finished planting, she decided to doze a little outside in the sun. It really was a beautiful day to be outside. Thanks to so many kind and generous friends and neighbors, we are getting spoiled with delicious meals - and though I feel a little funny about it sometimes, I can honestly say that it has been so nice to sit down together at the table without having rushed around to pull dinner together - and with less cleanup. It has been an extra little thing that has helped make the transition home easier, and we appreciate it and all of you SO much!